Fr. Wainwright comes to the Cathedral following twenty five years in parish ministry and four years in college chaplaincy. Wainwright was the rector of St. Peter’s Episcopal Church, Brentwood, in Pittsburgh’s South Hills, and the Episcopal Chaplain at Pitt. A native of England, his primary interest is in Church History, for which he was awarded a Ph.D. from the University of Kent in 2016. 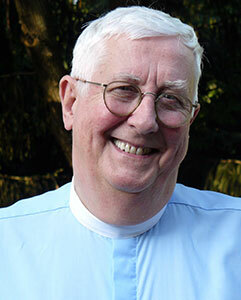 He has also studied extensively in the fields of homiletics, liturgy, and moral philosophy. He has six children and four grandchildren, and he and his wife, Thekla, live on Mt Washington, from where he can walk to the Cathedral… when the Incline is working. Fr. Wainwright can be reached at pw@trinitycathedralpgh.org or 412-232-6404 ext. 128.